Kolumadulu Atoll Maldive Islands, Indian Ocean. 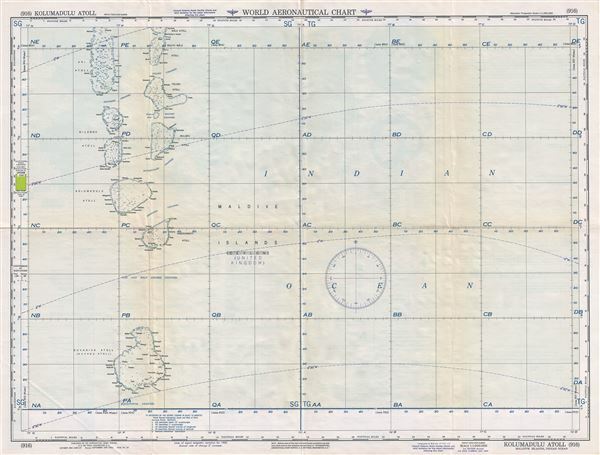 This is a fine 1954 U.S. Air Force aeronautical chart or map of the Kolumadulu Atoll and vicinity of the Maldives located in the Indian Ocean. Focusing on Kolumadulu or Thaa Atoll, the map covers the Suvadiva Atoll, Haddummati Atoll, Nilandu Atoll, Mulaku Atoll, Felidu Atoll, South Male Atoll, Ari Atoll and port of the Male Atoll. The Island of Male, where the capital of the Maldives is located is identified. The map is highly detailed and notes hydrographical and topographical features essential for the air pilot. Verso of this chart features legends and a world aeronautical chart index. This chart was published by the USAF Aeronautical Chart and Information Service, and was issued as chart no. 916. First issued in 1946, this is the third edition revised to Jan 1954.